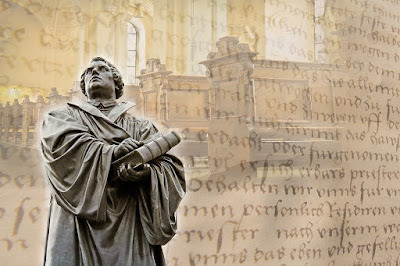 500 years ago today, on 31 October 1517 Dr Martin Luther, an Augustinian friar and university teacher in Wittenberg, did something that sparked a Reformation - or a revolution, depending on your viewpoint. Martin Luther wrote a letter to his Archbishop objecting to the corrupt practices that had developed around the selling of papal indulgences. Those corrupt practices, especially statements of some preachers, had misled people as to the true nature of repentance. Included in the letter is a list of 95 theses. This was a list of questions and propositions for academic debate in the University of Wittenberg on the power and efficacy of indulgences. He may have hung this list on the door of Wittenberg Castle church, as this was a usual place for posting such notices. More significantly, the list was printed and so was quickly widely distributed and discussed far beyond Wittenberg. Today, 18 October is the feast of Luke the Evangelist. He is also known as St Luke. Are you marking this day? If so, how? 1. Celebrate St Luke with food. Some people like to eat beef of St Luke's Day. That is because of the tradition that since early Christianity Luke's Gospel (and its writer) has been identified with the winged bull or ox, one of the 4 living creatures around God's throne, described in John's vision in Revelation.